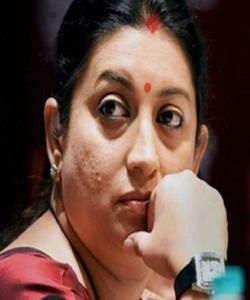 Smriti Irani Not to Contest from Amethi? During the last four years, Mrs Irani has worked a lot for Amethi constituency. Amit Shah and his party men are bent upon not to leave any chance to defeat Rahul Gandhi, the sitting MP. Sources say that the party is not in mood to give any room to voters hence decided to field local leader instead of Mrs Irani. The name of Annant Vikram Singh, son of first wife of Sanjay Singh, and Mrs Garima Singh, are in round. One more local leader, and RTI activist, Gopal Das from Amethi has taken vow to contest against Rahul Gandhi. Sources say, RSS and BJP are enthusiastic because in 2009, BJP could secure only 6% votes and in 2014 dramatic increase to 34% and Rahul Gandhi's vote% dropped from 72% to 47%. In 2012 UP elections, BJP could not open their account in Amethi, but in 2017, they have secured 3 seats. RSS is treating Amethi as a laboratory to try and defeat Congress and party President. Das, as sources say, is very confident of his victory and also say if Rahul Gandhi shifts to Rae Bareli then he will also shift there. Congress are very deep rooted there and the chances are bleak for BJP?